I can’t believe I had gone through so many years, working in libraries, without discovering this gem until this past week. Since gnomes make up a big part of this year’s summer reading theme, I have a gnome display on the bulletin board in the children’s area. One of my coworkers and I started talking about the nature of gnomes, and she showed me this deluxe edition of “Gnomes” by Wil Huygen. Admittedly, I haven’t read many books about gnomes, but I would bet that this book is the ultimate and definitive guide to gnomes. It was easy to see why this book would and apparently does appeal to so many. The author was a physician, and this is reflected in his observant, scientific writing style. Gnomes become so fascinating, so interesting, and the world they live in is huge and magical and even real thanks to the author’s “field notes” about gnomes, their behaviors, and their environments. Rien Poortvelt’s illustrations are beautiful. They have such an old world feel and the cursive of the letters which explain certain points of interest in the art creates a lovely visual balance. 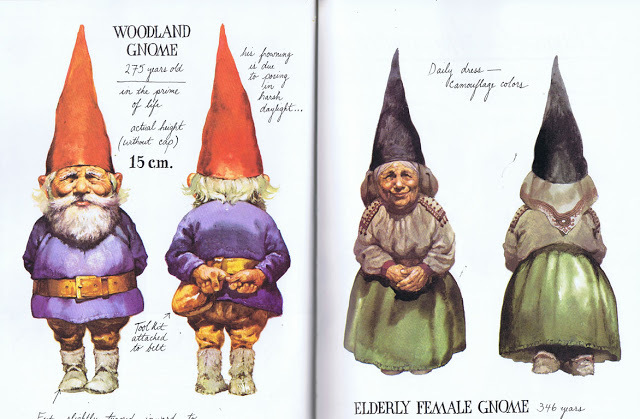 The author and illustrator cover everything there is to know about gnomes. They even cover the lesser known parts of gnome biology and sexuality, as well as the different kinds of gnomes from the familiar House Gnome to the nefarious Siberian Gnome. 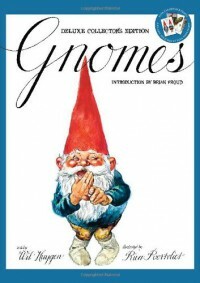 This book would strongly appeal to gnome fans as well as those new to gnome folklore. I consider it an essential text for any serious fantasy reference collection.